Well, this has been a hard one. The time has come for AFL Media's Phantom Draft top 30, but it has not been easy at all this year. The players at the top end are so even that clubs are still spending the last 48 hours leading up to draft night deciding on their plans. Piecing things together, particularly without a lock at No.1, has made the 2017 crop a unique one. With things still in flux, we will have the Late Mail Phantom Draft through on Thursday night with all the latest whispers ahead of the NAB AFL Draft in Sydney on Friday night. Rayner is the standout player in the pool and one who can change games in a matter of minutes, which has been why he has been touted as the likely No.1 pick for most of the year. As a forward he can take marks and kick goals quickly, and in his stints in the midfield he has shown he can be a damaging force there as well. The 18-year-old is a popular, bubbly personality who is well liked within his group, and will be able to settle into AFL life well. Yes, his slow 2km run last week was underwhelming, but it was not a huge surprise given his layoff with injury and time out of footy. Should the Lions go with him at No.1 they will get a crowd-pleaser and one of the most exciting talents to come through in recent years. If not him? It appears to have come down to a race between Rayner and Andrew Brayshaw for the No.1 pick, particularly after Brayshaw's big end to the season and great NAB AFL Draft Combine. Luke Davies-Uniacke was another contender, while Paddy Dow was also touted throughout the year. The midfielder is right near the top of club draft boards for many reasons. If Davies-Uniacke is not the most complete onballer in the pool then he's very close. He can win the ball at stoppages and burst away, he's good by foot and he has a nice blend of contested and uncontested disposals. Davies-Uniacke is a reasonably relaxed personality, one keen to surf as much as he can and unwind that way. But he's assured clubs throughout the year he is serious about his footy and he wants to have a long and successful career. The tools are all there for that to happen. The Dockers are looking to add some genuine young star midfielders to their list and Davies-Uniacke fits the bill. If not him? The Dockers have midfielders in their sights, so could go for Paddy Dow or Adam Cerra here. Cerra was all the talk on Wednesday for this spot. Plus, they'll have to think very hard about Cam Rayner if the Lions go for Andrew Brayshaw at No.1. Carlton has long been linked to Dow and would get a quality, explosive, all-round midfield star in the Vic Country midfielder. Dow was an early-season riser up the draft board and has stayed there since. He's a great mix of traits that every club would want to bring into their midfield: he's tough and puts his head over the ball, he's quick, marks well above his head and can go forward to kick a goal (which he does with regularity). He played some dominant games across the year and stands up when his team needs him. Dow is a down-to-earth, smart and well-respected prospect who will be well loved by fans for his fierce approach on the field and likeable approach off it. If not him? If Cam Rayner got past the Lions and Dockers, it would be a tight call between Dow and Rayner. Otherwise, Carlton might have to call it between Dow and Adam Cerra, with the latter also a big chance. The South Australian's struggles for form this season haven't stopped clubs from being very keen on taking him as an early pick at the draft. Fogarty is no-nonsense, on and off the field. He plays with a robust style that sees him push others out of the way, mark strongly on the lead and use his penetrating right foot to create the play. He's also been honest with clubs about his difficult season, which was cut short by a knee injury. Nevertheless, North needs a star and Fogarty has the traits to be one. They've watched him closely and he can change a game. If not him? They've been linked with midfielders for a long time, so Adam Cerra, Paddy Dow and Andrew Brayshaw will be considered. Cam Rayner is still a chance to get through to No.4, at which point you'd think the Roos take him. It's been a sharp rise for Brayshaw, whose back end of the season and then terrific showing at the Combine thrust him right up the draft board. The midfielder ticks so many boxes – he's hard at the contest, able to spread away with the ball, he spots up targets nicely by foot, he floats forward to kick goals and he's considered a future leader. The younger brother of Melbourne's Angus, Brayshaw is articulate, considered and switched on for what lays ahead in his AFL career. He also has plenty of family links in Western Australia, which would make the transition easier for him should he head to Freo, and they could pair him with Haileybury teammate Luke Davies-Uniacke. If not him? It will be a good combination whichever way it goes for Fremantle, with Adam Cerra and Paddy Dow the other most likely options. Jaidyn Stephenson has also been linked as being a shot for the Dockers at this point. He might not be the key position type the Pies will be searching for, but getting Cerra at No.6 would add more polish to a very good midfield. The class and poise that Cerra possesses will appeal to clubs at the top of the draft order, with the Eastern Ranges teenager one of the better ball users in the pool. Cerra hasn't played as much footy over the past two years that he would have liked but when he was out there he showed his skills. He's also very tough. Don't let the well-spoken, controlled and calm demeanour fool you – he's a hard and determined competitor when the ball is up for grabs. If not him? Aaron Naughton, Darcy Fogarty, Jaidyn Stephenson and Andrew Brayshaw are the other main contenders here, while Ed Richards has been all the late mail. St Kilda can't go wrong with Clark, who is a super all-round prospect. He can play as an attacking half-back, which he did well before this season, and as he showed in 2017 he is a very good inside midfielder. The Dandenong Stingray is courageous and composed, he kicks well on both feet, and can push forward to hit the scoreboard. He averaged 26 disposals this season. Clark doesn't crave attention and is laidback, but there's a steely resolve to him that will underpin his career. If the Saints want to add to their midfield, Clark is the best option here. If not him? The Saints will have to see if anybody from the top group falls through. Will they look at Jaidyn Stephenson here? He may be a chance. As is Adam Cerra and Aaron Naughton, who the Saints have shown interest in. The Saints have done plenty of work on Coffield throughout the year and would be able to pair him up with Clark to bring in two rock solid options who both offer some different things. Coffield is a quick, rebounding general defender who clubs also see playing in the midfield in the future and where he played some good footy this year. He uses the ball well and can set up the play, and he makes smart decisions. The Northern Knights captain averaged 21 touches at TAC Cup level this year and was selected in the under-18 All Australian team. If not him? It wouldn't be a surprise to see the Saints jump at Aiden Bonar with one of their picks, and they have also put in time to check on Darcy Fogarty. One of them would bring some possible star factor to the Saints. Naughton pushed himself to the top of the list of key defenders with a great end to the season playing with Peel Thunder's senior WAFL side. His form with and against AFL players was impressive, and he showed his great athleticism at the Combine at the end of the year. He's quick for his size, agile, competitive and makes himself very hard to beat. Naughton grew up in Victoria before shifting to Perth, so a move back to Melbourne would not faze him. The Dogs are one of a number of clubs interested in the backman and can bring him in knowing he plays soon. If not him? The Dogs have been linked to Nick Coffield and half-back Ed Richards, half-forward Aiden Bonar, and also Darcy Fogarty should he still be there. In Richards the Blues would be able to get a classy user out of half-back who can control the play with his foot skills, his turn of pace and real composure. Richards, the grandson of Pies great Ron Richards, came to attention in the second half of the season with his form for the Oakleigh Chargers. The quietly spoken 18-year-old didn't play at the mid-year national championships but shone at school level and quickly rose up the ranks to be seen as one of the best attacking defenders available. If not him? Lochie O'Brien has been invited to the draft and it could be a toss up between him and Richards for the Blues. Hunter Clark would be a great pick if he is there, Aiden Bonar is another in the mix, while Nick Coffield and Oscar Allen would be looked at too depending on how the early picks pan out. Out: Devon Smith. In: Higgins? Higgins is a ready-to-play small forward who will step into an AFL team next year, and that would have to appeal to the Giants, who are in premiership mode. Higgins had an outstanding season at all levels he played in 2017, claiming Vic Metro's MVP award at the national carnival and also taking home the TAC Cup's Morrish Medal after kicking 32 goals in 14 games for the Chargers. The 18-year-old will leave nothing in the tank in his bid to get to the top and would be a very good fit to be in the forward line next to Toby Greene. If not him? They are very keen on Aiden Bonar and his power and athleticism could win out over Higgins. Lachie Fogarty is also a good chance as a small, tackling forward and he has a strong family link to Giants co-captain Cal Ward. Ed Richards is another possibility. Bonar will be one of the most interesting players to watch on draft night and the Crows could get a good one with him at 12 if they go his way. He is a powerful forward who, in time, is seen by some as becoming a strong-bodied inside midfielder. He is athletically one of the best prospects in it – quick, agile and can jump – but recruiters will weigh that against his history of having two knee reconstructions. If not him? Hunter Clark will appeal in the slim chance he gets to the Crows' pick. Nick Coffield is another shot, Ed Richards' dash could make them think hard, while they'd find it difficult to pass on Darcy Fogarty if he's surprisingly still on the board at 12. Clubs think the Eagles will look for a midfielder here, but could they see Allen playing in that role down the track? It's a chance, because he has a good endurance base and at 191cm would be able to use his frame to be an imposing figure. Right now, however, Allen is a tall and marking forward who leads up and down the ground and converts his shots at goal well. He works really hard and because of that gets in good positions. Allen is a deep thinker about his footy, having studied key forwards closely over the past few years and found ways to model his game on others. If not him? Ed Richards could be looked at here for the Eagles to provide some dash, while they may consider Jack Higgins to fill their need for a small forward. He'd be a good pick. They like Lochie O'Brien, while Nick Coffield and Aiden Bonar will be strongly looked at if they are available. The hard-running wingman/half-back has a couple of big weapons that appeal to clubs. He's a beautiful left-foot kick (and good on his non-preferred right as well), and he can run all day, having had a top-end athletics background in recent years. O'Brien's season was interrupted by a nagging knee injury that annoyed him at stages through the year, but he had a very good NAB All Stars game on Grand Final day and subsequent Draft Combine, where he finished second in the 2km time trial. If not him? The Swans met with small forwards Lachie Fogarty and Jack Higgins this week, so they are clearly in their thinking. Strong word that if Aiden Bonar is there they'll pounce, while Oscar Allen and Jaidyn Stephenson are other possibilities. Plenty of clubs rate Fogarty pretty highly, and his numbers do look good across the year. He's clean with his hands, smart and clever by foot and he chips in with goals on a regular basis. He's also a consistent tackler who applies good defensive pressure when stationed in attack. Fogarty might start as a small forward, but once his running improves he should be able to get into the midfield. If the Lions grab Cam Rayner at No.1, then his close mate Fogarty will appeal a little more to couple the two for a move to Brisbane. If not him? Midfielders have been on the Lions' agenda, but could they look at Jarrod Brander here as a versatile tall? Key forward Oscar Allen might also appeal for that reason. Small forward Jack Higgins is also on the Lions' radar. The talented and versatile prospect gave away a promising cricket career to focus on his footy and it is set to pay dividends on Friday night, when he attends the draft in Sydney and hears his name called by a club. The Dogs are a chance here, having been linked to Murphy at this spot. Murphy came to recruiters' attention playing as a forward for Brighton Grammar in Melbourne before running out for the Sandringham Dragons in the TAC Cup, where he was also used as a half-back. If not him? The Dogs met with Jack Higgins recently, and they are also interested in Lachie Fogarty at this spot should he get past the first 15 picks. They've been linked to a bid on Richmond father-son Patrick Naish, but that is not likely. Ed Richards and Lochie O'Brien could be in the frame. Stephenson's heart condition that was uncovered at the recent NAB AFL Draft Combine has concerned some clubs enough that he could be available to the premiers when nobody could have imagined that two months ago. The Tigers still have to make a call at that point, but Stephenson is a unique prospect, with a different set of skills and if cleared by Richmond medicos would be a draft bonus for the premiers. He is quick and sharp and nimble, he has a good leap, and he loves to dash away with the ball. He'll start his career in the forward line and is capable of kicking bags when given some space. If not him? 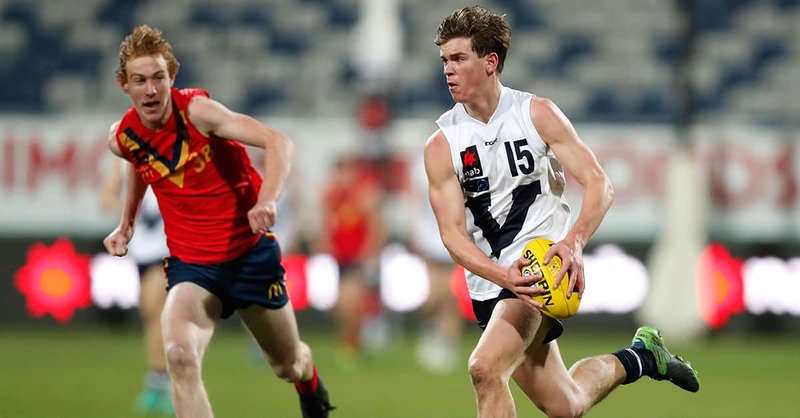 The Tigers have three picks within nine selections so have a few in their mix, but could jump for Charlie Ballard here, or go with Jarrod Brander. There's a chance Jack Higgins is also still on the board. Bailey is a rough and ready midfielder who digs his head in, wins the ball and then bursts away with it. He has a genuine turn of speed out of a stoppage and played well for all the teams he played with this year, having moved from the Northern Territory to South Australia, and also playing for the Allies at the NAB AFL Under-18 Championships. He's not big, and has a couple of chinks in his armour, but his work rate and willingness to get the ball forward would appeal to the Lions as they hunt midfielders at this point of the draft. If not him? The Lions have targeted midfield depth at the draft, but there aren't heaps who would fit into this type of range. Charlie Constable may be around this area of the draft but there are questions on his running. It also might be a bit too early for the Lions to go with Jack Petruccelle. The tall and athletic midfielder has bolted up the boards to be a contender for many clubs as a top-30 pick. He grew late as a teenager and shot up about 15cm within two years to become a rangy player who is good overhead and a nice user of the ball. He played for Sturt's under-18s and reserves premierships late in the year and appeals as someone who can move all over the ground. If not him? The Suns have been linked a little to speedster Jack Petruccelle, but it might be a little early for him at this spot. Zac Bailey is another possibility, while there's even a chance Jaidyn Stephenson gets through at which point Gold Coast would seriously consider. Nathan Murphy is another one they have been closely linked with. Richmond has put more work into Brander since it became clear the key swingman might be available at their pick. The Tigers won the premiership without too much support for Jack Riewoldt in attack from the talls department, but Brander could play a marking role there as well as in defence. He started the season tipped as a possible No.1 pick but inconsistency has seen him drop a bit further back down the order. At this spot he would be difficult to pass up. If not him? Could the Tigers look for another small forward after their premiership success? Brent Daniels might appeal in this range. As may Gryan Miers. If Charlie Ballard is here the Tigers would have a think, while West Australian key defender Sam Taylor would offer some back-up if they don't go with Brander. The Eagles have been linked to Stoddart as a player who can come onto their list and bring some more run, drive and excitement through from defence. In time he will likely be able to spend some more minutes in the midfield and on a wing, but Stoddart will need to lift his possession rate before that happens. For now, though, his lovely ball use and good temperament make him a good option in the second round. If not him? Might the Eagles go local and grab WAFL star Tim Kelly? He looks to be in their range. As strange as it sounds there's also a chance that Jack Higgins gets through to this stage, at which point surely the Eagles would pounce. The Cats can bolster their defensive stocks by grabbing Taylor, who is one of the better key backmen in the pool. He's strong in the air and reads the play well, and plays with a good competitive nature. He's also trusty with the ball in his hands and performed well for Western Australia at the under-18 championships. If not him? The Cats have been linked to WA mature-ager Tim Kelly, plus they could look at another tall in Tom McCartin. Local half-back Matthew Ling may also appeal, while goalkicking small forward Liam Ryan could be a sneaky chance. The Roos will be looking for some speed at the draft, and if they don't get it at their first selection then they can perhaps be a little more targeted with their second choice. Ling would bring the run and pizzazz from half-back. He's a line-breaker who loves to dash and shimmy around opponents before sliding onto his left foot to deliver the ball down the ground. He was a key player in the Falcons' premiership side at TAC Cup level in 2017. If not him? North might be keen on midfielders, but it's hard to find the real top quality ones at this point at the pool. Would they look at Charlie Spargo here as a small forward option who will start as a forward but eventually go inside? Geelong was one of the clubs linked to Devon Smith before the ex-Giant headed to Essendon, and they could get a mini version of him in Daniels. The pocket rocket forward/midfielder enjoys baulking opponents and doing some cheeky stuff when in possession, but he's a good user of the ball and smart whenever he has it. He also played a game for Geelong's VFL side this year, having attended the local Geelong Grammar, so the Cats will know his work closely. If not him? Could Geelong be the club to keep Richmond honest and place a bid on Patrick Naish? It's possible they do and force the Tigers to match with their third pick. Charlie Constable could also be in the mix here as a big ball-winning midfielder. The back-to-back All Australian has been sliding down the draft order since an underwhelming run at the Draft Combine, which made some clubs believe he would take a long time to be ready to ruck at AFL level. That means some are now viewing him as a tall forward who can pinch-hit in the ruck rather than the other way around. The Tigers, at their third pick and fresh from a flag, could grab him and give him time to develop because he certainly has some excellent traits to his game and plenty to work with. If not him? Callum Coleman-Jones is another tall prospect who could be selected in this draft range for clubs searching to add to their big man stocks. Coleman-Jones had a couple of really good games at the national carnival for South Australia as a roaming, athletic ruckman that showed he can run and jump at the ball. When up and going he is a big man who can find it around the ground, and his hands are hard to break when he's flying for grabs. An injury ruined the second half of his season but he ran the 2km time trial last week and West Coast could look at him as ruck back-up having lost Drew Petrie in that role at the end of the season. If not him? All depends what the Eagles are after, but Liam Ryan may be a show, Charlie Spargo could get a go, while Andrew McPherson would be a good get at this point for a position across half-back. It was a magnificent season for Naish, with the developing outside midfielder playing great footy for the Northern Knights at TAC Cup level and also for Vic Metro at the under-18 championships where he was named an All Australian. Naish is a runner and a kicker: he will give a team great mileage because he likes to take things on and then use his quality right-foot disposal to size up targets. He also kicks goals, and has shown a capacity to do that on a regular basis. The son of former Tigers forward Chris Naish, the 18-year-old has spent time at Punt Road as part of the club's father-son academy program and is bright, bubbly and entertaining company. If not him? This would be the perfect scenario for the Tigers, to get Naish after they have already use their first three picks. The main dangers for a bid before this stage are North at No.23 and Geelong at 22 or 24. If a bid comes here, Richmond will match it as fast as possible and bring in their first father-son since 2003. The key defender was named in the All Australian under-18 side after a consistent carnival for his state that saw him given the South Australian MVP award. The Giants are fans of Petty, he would help out their tall defensive stocks and is a player who can match up on bigger forwards as well as the medium types. The second round of most drafts tend to feature a fair few key backmen who are solid types ready to play, and Petty should be in that range. If not him? Who haven't the Giants been linked to? If they're after a tall, athletic ruckman Callum Coleman-Jones could appeal, particularly given the retirement of big man Shane Mumford. Half-back Joel Garner is also of interest to them. The quick and explosive Northern Knights prospect would bring immediate line-breaking ability to the Giants' mix. He's got some things to work on, like his consistency and his ball use by foot, but his electrifying speed gives him a real edge. He can play through the midfield, or across half-back or half-forward, and had a couple of standout games across the season. If not him? The Giants, including coach Leon Cameron, have met with Ryley Stoddart and would be a strong chance to grab the attacking half-back if he was still available at this spot. Brent Daniels is a small forward they could look at if they don't go small at 11, the same for Gryan Miers. The Aspley flyer with the flowing red hair has caught attention this season playing in the NEAFL, and with his pace and ball-carrying ability could add another element to Melbourne's midfield mix. Baker, who was previously a member of the Brisbane Lions' academy before being cut and thus making him available to the open draft pool, was overlooked at last year's draft but had a terrific season to stake his claim for a spot on an AFL list. If not him? Zac Bailey could be snapped up already but would be a strong chance to land at the Dees if he gets there, while Vic Country pair Matthew Ling and Brent Daniels would also likely be considered. Who will your club target later in the draft? A number of players have been linked to clubs after the first 30 selections. AFL.com.au has found some of the possible options available for picks after the early stages of the draft. We have listed every draft choice assigned by the AFL, and also predicted how many each club is expected to use with a total of approximately 77 selections. Unlike the Phantom Draft top 30, where the draft order has changed according to a possible father-son bid, for the below selections we have kept the order as it will start according to the AFL. It will change across the night as bids come and are matched. It won't be a very busy draft night for Hamish Ogilvie and his Crows recruiting team, with the club likely to use only one more selection after their No.12 pick. At No.39, Adelaide has been linked as a possible suitor for Toby Wooller, a medium forward from the Oakleigh Chargers who kicked 43 goals this season. He's a chance to be available. Andrew McPherson is another who could be in the Crows' sights at No.39, as will be key defender Harrison Petty should he get that far. McPherson is a running backman/midfielder who missed a large portion of 2017 with soft-tissue concerns but is a very solid prospect, while Joel Garner could also be a shot at that mark. Adelaide has nominated Jackson Edwards, the son of former great Tyson, as a father-son rookie and can grab him on Monday if he is not taken in the national draft. It seems unlikely Edwards will get snapped up by anyone else. The Lions will open the batting on Friday night and all attention is on their call at No.1. Their three first-round picks mean they should end the night as big winners. With their three picks after 30, it seems likely two will be used on academy prospects Connor Ballenden and Jack Payne. Ballenden, a key forward, appears unlikely to attract a bid in the first 25 picks, and after that the Lions appear likely to match a bid for him. They will also get a points discount on Payne, a tall defender who performed well this year. With their last pick the Lions are a chance to take Oakleigh Chargers running defender Noah Answerth, who missed most of the year with a back fracture but is fit now and would be a nice get late. Hamish Brayshaw may also be in the mix if they pick his brother Andrew at No.1. The Blues have three picks in the first 30 selections, so list manager Stephen Silvagni will again do most of his work early on. Still, Carlton found a couple of later selections at last year's national draft who went on to play at senior level last season and so will be hoping for the same this time around at pick 72. Someone like Ethan Floyd, with his zip and endurance base, could appeal as a midfield option late, while Matt McGannon, a medium forward who had some nice games for Gippsland Power this year, could also be worth a shot. If the Blues want to look for a half-back after Sam Docherty's injury ruled him out of next year, then maybe Ben Paton could appeal if he is still available. Carlton has access to Ethan Penrith under the Next Generation Academy rules but won't be drafting him. Collingwood has nominated Tyler Brown as a father-son pick, and there's a good chance a bid won't come before pick 38 for the medium midfielder who is the son of premiership Pie Gavin. That would be the ideal result for the club, but there are a few clubs who like him in that range. If the Pies go with a midfielder at No.6 they could look to add some key defenders to their mix later on. Noah Balta has been linked to the Magpies and has some genuine athletic qualities, while tall stopper Oscar Clavarino might be a solid selection with a pick later in the draft if the Pies want to bring in some depth in that area. After a stellar trade period that saw them net Jake Stringer, Devon Smith and Adam Saad without losing any of their own players, the Bombers won't have a big say on the draft for the first time in a couple of years. But they still have a couple of priorities they could address at the draft, including adding an inside midfielder and a ruckman. James Worpel is a chance to still be available at this mark and would be hard to pass up, while Tom North has proved himself as a ball-winner at TAC Cup level. Cassidy Parish, the younger brother of Bombers midfielder Darcy, could be a shot later or as a rookie for the Dons as a clearance specialist. In the ruck, Vic Country big man Lloyd Meek might appeal later on after the 19-year-old stepped up to the VFL at times this season for North Ballarat, while they have also shown some interest in WA mature-ager Scott Jones. Fremantle has the biggest investment in this year's draft, with the club to use eight selections on Friday night. They can't really go wrong with their two top-five picks, but after that the rest of their selections will be later on. Inside midfielder Tom North could get a look, hard-runner Angus Styles has some very good traits and is a chance to land a spot, while they have also put some time into Tasmanian key forward Hugh Dixon. Dixon is mobile and works hard, and at 195cm is a reliable target in attack. He claimed Tasmania's MVP in the under-18 academy series. The Cats will have at least two – and maybe three – picks after the top-30, and if they don't grab local key forward Tom McCartin with pick 22 or 24 then he could be their guy at No.35. It's possible that happens. A few players have been linked to Geelong at that point, including medium forward Toby Wooller, whose grandfather Fred captained the club's 1963 premiership. Andrew McPherson is also a chance, while mature-ager Tim Kelly has also been mentioned as a possibility for the Cats after the 23-year-old's terrific season at WAFL level. Former junior tennis star Jackson Ross could come into the Cats' thinking at No.58 if the 192cm forward is still available. The Cats could also look at former Collingwood rookie Lachlan Smith having shown some interest in the now country footballer. The Suns' draft focus changed dramatically during the trade period, when they used their No.2 pick to land Lachie Weller from Fremantle. They'll open their account back at pick 19 now, and then appear most likely to have three more picks later on. Two of them could be used on local academy prospects. Brayden Crossley was the All Australian ruckman, he improved his fitness across the year, and has a physical and aggressive approach that was seen at NEAFL level for the Suns. Another possible academy graduate is Connor Nutting, a forward who is exciting, takes a good mark and has pace. By trading Devon Smith to Essendon, the Giants were able to break back into the early stages of the draft and they have a good hand with three top-30 selections. They'll use two more after that, and one could be used on academy selection Nick Shipley, who is a contested ball-winner who played in the NEAFL with the Giants. The Giants went with mature-agers last year by bringing in Freo pair Tendai Mzungu and Matt de Boer, and have been linked as having some interest in former West Coast backman Mitch Brown. Brown played at amateurs level in Melbourne this year but has nominated for the draft, although he may fit more as a rookie pick. It's another late start at the draft for the Hawks, with only Port Adelaide and Essendon having to wait longer to get into things. The best case would be someone like Matthew Ling slipping through, and because it's such an even group between picks 20 and 40, anything's possible. Ling is a dashing half-back with a nice left foot. Joel Garner could be a possibility as well around this mark as a medium defender who is strong-bodied and can offer rebound, while Callum Coleman-Jones is a chance to offer some depth to their big man ranks. A player like David Handley, a medium forward with good pace, might be available later on, while the Hawks have nominated Changkuoth Jiath as a Next Generation Academy player and will see if a bid comes for the speedy forward of African descent. The Dees gave up their first pick as part of the deal to land Jake Lever, but will have four selections in the space of 18 between No.29-47. Medium forward Toby Wooller could be in with a shot with their selections in the 30s, while Casey Demons forward Bayley Fritsch could be a chance after a starring season at VFL level that saw him make the team of the year and kick 44 goals. Small forward Liam Ryan could also be on the radar after an excellent season in the WAFL that saw him take out the leading goalkicker award, while the Dees have been linked as possible bidders for Collingwood's father-son prospect Tyler Brown. All eyes will be on North's first pick, which is its earliest draft selection since 2006. But they also have at least a couple of later picks that they'll be keen to find some talent with. Oskar Baker has put himself on the radar of clubs with his NEAFL season and his genuine pace and line-breaking ability should see him get picked up. It's not without a chance that he's still on the board at No.64. They'll likely use four or five picks on the night, with Tristan Xerri a ruckman who they have also spoken to and could also look at late. Port recruiting manager Geoff Parker will have a very long wait before his turn comes on draft night, with the Power entering proceedings at pick No.46. But they are likely to use four selections within 16 places, so will be busy in the third and fourth rounds. Small running midfielder Dylan Moore could come into the Power's thinking with one of these picks, as may the nifty left foot of Kane Farrell, who can play as a small at both ends. They've shown some interest in Angus Schumacher, a prolific midfielder for the Bendigo Pioneers, as well as versatile half-back Noah Answerth. West Australian Jake Patmore should be available around the Power's bag of picks and could be looked at as a ball-getting medium defender/midfielder. The perfect result for the Tigers would be for them to secure three players, and then have to match a bid for Patrick Naish by using points from their fourth and fifth selections. In that case their fifth and final pick could be slightly pushed back a bit further until later in the draft. Depending on what they grab with their earlier picks, they could look for a smaller type in the mould of Dylan Moore, who had a very consistent season, or they could try to pick a tall like Hayden McLean, who finished the year in better form and works hard in attack. The Tigers have access to Derek Smith Jr, who played in their VFL side at stages this season, as a Next Generation Academy prospect but a rookie consideration seems more likely than the national draft. Charlie Ballard will be right in St Kilda's thinking if he gets through to their third selection. The athletic, tall midfielder is on their radar and has the versatility to complement whatever the Saints get with their pair of top-10 choices. Ryley Stoddart might be another who gets a look if available, while the Saints would also likely look at Tom McCartin, the younger brother of former No.1 selection Paddy, if he is still on the board. Andrew McPherson is another chance to get through the first 30 picks, while Brandan Starcevich is also a player around this mark. The medium forward has a few fans after an impressive end to the season. The Saints could also be the club to place a bid on Brisbane academy tall Connor Ballenden, although at that point the Lions would be expected to match. A couple of taller types could be on the radar of the Swans, with Callum Coleman-Jones and Tom De Koning linked to Sydney as later choices. Coleman-Jones is an athletic ruckman who can roam around the ground, while De Koning is a lean and tall forward whose season was cut short by a lacerated kidney. Athletic key forward Tom McCartin would also be a very good chance if he gets through to pick 33. High-flyer Jordan Houlahan is a shot there too if he's still on the board, while the Swans could also spring something of a surprise by looking at Flynn Appleby with their last choice. The medium defender did some good jobs at TAC Cup for the Greater Western Victoria Rebels and in the VFL as well, and has caught their interest. He'd be a smokey to keep an eye on. Jake Brown is the most likely member of the Swans' academy to get a chance, perhaps as a rookie. With six selections, the Eagles are one of the most invested clubs in this year's draft. They traded next year's first-round pick out and got some more second-rounders in for this year's draft, and there should be some handy players around that mark. James Worpel is a chance to add to their midfield stocks and he is most likely to be available, while sturdy half-back Andrew McPherson has also been linked to the Eagles. Inside midfielder Tom North could be a chance later on, as may the WAFL's leading goalkicker Liam Ryan, an exciting small who is a better shot at being taken this year after being overlooked in 2016. Local prospects Brayden Ainsworth and Brandan Starcevich could also be on the radar, while big man Tristan Xerri could be another late option. With two picks in the first round the Dogs have the chance to replenish their list with some more top-end talent. With their early picks they could look at needs and add some classy ball-users or taller types of either end, and then they'll have a fair break before picks – not rejoining proceedings until pick 79. Who really knows who could get through to there? The Dogs have had a look at former elite tennis junior Jackson Ross, and he's likely to be picked somewhere in the second half of the night. He's an agile 192cm forward with a good reach. Could Ben Miller's excellent combine testing and elite athleticism see the Bulldogs have a look at the WA key defender late?